While it is appreciated that oncogenesis arises as a result of the accumulation of selectively advantageous somatic mutations, many of which can be mapped and sequenced, therapies that effectively reverse the unchecked tumor growth phenotype are sorely needed. Although cDNA screens can identify proto-oncogenes, siRNA libraries can identify potential targets for therapeutic intervention, small molecule screens in cellular cancer models to selectively impair tumor cell growth may identify both pathways, targets and drug candidates for cancer therapy. An outgrowth of the genomics revolution has also rejuvenated an age-old approach to drug discovery, cell-based screening. The ability to survey small molecule space in disease-relevant cellular pathway screens affords the opportunity to rapidly identify bioactive compounds for target identification (either by affinity approaches or in rare instances informatics) and tumor cell therapy. High-throughput screening of large, diverse chemical libraries has become fairly commonplace in academic and industrial settings (Clemons, 2004; Edwards et al., 2004; Eggert et al., 2004). Due to the significant literature covering this space, this chapter will focus more on the advances and uses of parallel screens of small molecules against cellular assays and analysis of the resulting multidimensional datasets. Over the past 10 years advances in high-throughput screening, robotics, combinatorial chemistry, and assay technology have set new standards in drug discovery lead generation (Cox et al., 2000; Floyd et al., 1999; Sundberg, 2000; Weinstein et al., 1992). Despite the capabilities and the enormous data they create, the failure rate of drug candidates in the clinical and preclinical phase is still high, primarily due to unexpected biological side effects such as toxicity (Schuster et al., 2005). Large-scale screening databases routinely contain records of millions of compounds and their activities across a multitude of biological assays. Recently, it has been realized that interscreen data analysis across large-scale screening databases can be usefully mined for additional information on the activity of drug candidates. Analyzing the results of many screens at once affords the ability to negatively select compounds which have problematic properties such as nonspecific toxicity. Compounds with attractive properties such as cell- or gene-dependent apoptosis can be quickly identified for follow-up. Profiling of lead compounds across batteries of biologically relevant assays could identify untoward side effects early in preclinical discovery but also beneficial properties such as alternative indications, orphan target modulation, and new biology (Butcher et al., 2004; Plavec et al., 2004; Rabow et al., 2002). Comparing compound activities across cellular data is inherently richer than biochemical or direct enzymatic measurements in a cell-free environment since cells encode the genetic networks and pathway architecture necessary to measure most physiology, especially that relevant to cancer such as growth, proliferation, checkpoint control, apoptosis, cell migration, and so on. At its most basic level, parallel screens comparing as few as two assays side-by-side is significant (Clemons et al., 2004). This approach has been used successfully to define new compounds with potential therapeutic importance in the area of oncology. For instance, Torrance et al. performed parallel simultaneous screens against isogenic pairs of colon cancer cell lines; one encoding mutant K-ras, the other a deletion of mutant K-ras, comparing data from about 30,000 unique compounds. By comparing the two screens, the strategy unveiled a new, differentially cytotoxic cytidine-containing compound which selectively eradicated mutant K-ras expressing cells (Torrance et al., 2001). Dolma et al. (2003) screened ^24,000 novel compounds against two cell lines: an engineered tumorigenic cell versus its normal, untransformed counterpart, to identify a potent small molecule inhibitor of cell growth, termed erastin. Fantin et al. (2002) screened immortalized epithelial cell pairs either lacking or expressing the oncogene neuT to identify compounds which could selectively induce cell type-specific BrDu-incorporation. These examples demonstrate the concept of parallel screens whereby straightforward subtractive analysis derived data to rapidly select compounds with desired qualities. Comparison across a multitude of cellular assays can derive more incisive information for follow-up work. For instance, compound profiling across a panel of phenotypic assays can portray the global effects of molecules from a given structural series from a lead optimization program, and guide chemical design to achieve desirable biological effects. As proof of concept, Kim et al. (2004) tested a library of structurally related compounds synthesized by diversity-oriented combinatorial methods, using a combination of monocyclized molecules and their corresponding bicyclic complement against a series of cellular growth-related readouts including DNA synthesis, overall cellular esterase activity, and mitochondrial membrane potential and intracellular reducing potential. Parallel tests of ^250 molecules and a small set of known drugs against the four cellular readouts in a total of 40 cellular assays resulted in a matrix of ^20,000 data points. In order to simplify the results, the matrix was subdivided into various descriptor sets such as number of rotatable bonds per compound. The overall cellular activity patterns of compounds migrated with their mono or bicyclic counterparts. Further analysis showed that subtle stereochemical alterations of the functional groups decorating the scaffold ultimately determined cell effects. These studies importantly demonstrate the possibility of using parallel cellular assays for quantitative measurement of the effects of discrete chemical modification. Parallel cellular profiling can be used to prioritize compounds readily. Shi et al. (1998a,b) showed correlation between activity patterns and molecular structure of 112 ellipticine analogues tested in the National Cancer Institute (NCI) tumor cell panel. The population subdivided into patterns associated with either normal ellipticines or N2-alkyl substituted elliptici-niums. The outliers were all dependent on specific structural modifications. Interestingly, a correspondence between p53-status and glioblastoma-like tumor types was manifest in the patterns, where the ellipticiniums were generally more active than the ellipticines in cells with mutant p53. The distinction provides the researcher with a rational means to prioritize and choose next steps in a compound progression scheme based on p53 status or on structural liabilities of these compounds. Haggarty et al. (2004) analyzed an antihistone deacetylase 1,3 dioxane-based diversity-oriented synthetic library using molecular descriptors to generate a multidimensional matrix relating chemical structure with activity. The results identified structural elements important for SAR relationships distinguished by tubulin- or histone-dependent substrate preference. These studies show again that multidimensional profiling can elucidate relationships between small structural perturbations and specific cellular activity, and define a roadmap for further studies. was first applied to the problem of identifying kinase-selective small molecule inhibitors that target protein tyrosine kinases. Tyrosine kinase in general play key roles in many cell growth processes and their misregulation leads to a number of disorders, most notably cancer (Blume-Jensen and Hunter, 2001; Hunter, 1998). Spontaneous translocations in which tyrosine kinase domains become fused to other genes (such as NPM, Tel, and BCR) have been identified as the basis for oncogenesis and several B-cell lymphomas, including the Philadelphia chromosome BCR/ABL and CML (Baserga and Castoldi, 1973; Tkachuk et al., 1990). Due to the difficulty of identifying selective small molecules that inhibit these tyrosine kinases, a parallel cellular screen may provide a more fruitful approach. In the first ACP experiment, several thousand small molecule kinase inhibitors including 2,6,9-trisubstituted purines were profiled against an array of 35 novel tyrosine kinase-dependent cell-based assays constructed in the mouse pro-B Ba/F3 cell background (Ding et al., 2001; Melnick et al., 2006). The experiment discovered selective small molecule inhibitors for a variety of tyrosine kinases, but also demonstrated structure activity relationships within subclusters of compounds which could be used to improve potency and selectivity against a given set of related targets. Interestingly, the approach showed that the relationship between tyrosine kinases based on sequence data did not superimpose directly with a dendrogram based on compound data. This type of phylogenographic analysis could reveal which side activities for a given set of compounds might arise through further optimization, either positive or negative for oncology drug development. Fig. 3 An automated system for profiling compounds versus panels of cellular assays. 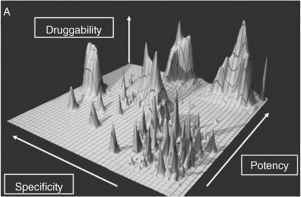 (A) Compound profiling provides multidimensional data for more informed selection of lead drug candidates, the depicted landscape represents specificity and potency of a panel of compound scaffolds two dimensions (x and y), with a z-axis representing druggability or the likelihood that the associated chemical scaffold can be optimized to become a drug. The schematic makes the point that choosing compounds based on multidimensional data may lead to more optimal drugs (z-axis). (B) The components of the automated compound profiling (ACP) system. The system comprises three custom environmentally controlled incubators, a 1536-well plate cell dispenser and reagent dispenser, a control station consisting of a computer running custom scheduling software, a CCD-plate reader, an inverted microscope with an automated stage and image analysis software, a compound transfer station, a tissue culture station for splitting cells, and a Staubli RX130 anthropomorphic robot with a custom plate gripper. Together these components integrate to perform high-throughput assays on panels of cells versus arrayed molecular libraries. (C) A photograph of the ACP installed at the Genomics Institute of the Novartis Research Foundation. 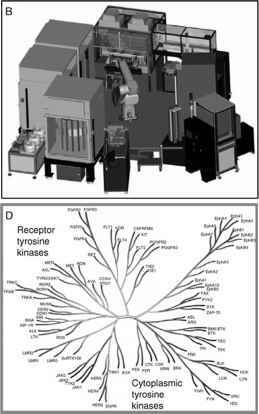 (D) The tyrosine kinome representing the first interrogated protein family using automated profiling technology. "polypharmacy," drugs developed for one purpose may have advantages in other diseases against other targets, the data was examined for unexpected side activities and novel properties. Glivec, designed to target BCR/ABL, for instance has described activity against pdgf and c-kit as well, which are the justification for pursuing Glivec in GIST and asthma. In this experiment, interesting cross-activities for other, less well characterized small molecule kinase inhibitors currently under clinical investigation were discovered. The pan-p38 inhibitor BIRB796 was shown to block Tie2, a protein implicated in promoting angiogenesis. Extending the inhibitor's activity to Tie2 could potentially increase the utility of this compound in cancer treatment. In another example, the dual inhibitor of Src-family kinases, BMS-354825, inhibited several Ephrin receptors implicated in both tumor angiogenesis and tumor cell survival (Brantley-Sieders and Chen, 2004; Brantley-Sieders et al., 2004; Kullander and Klein, 2002; Lombardo et al., 2004). The results of this profiling experiment indicate the potential for expansion into other tumor types. The ACP experiment demonstrates the power of multidimensional profiling not only as a strategy for detailed SAR and a framework for optimal chemical modification, but also to identify new therapeutic opportunities for small molecules. In fact, some of the most promising oncology drugs may currently be available as prescription drugs or generics for other indications. The idea of parallel cellular screens is, however, not entirely novel. 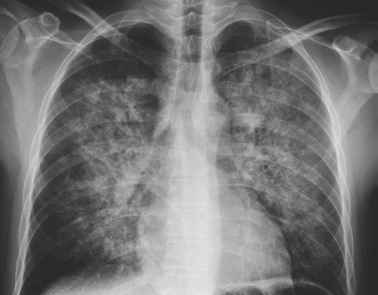 The US NCI has been pioneering the approach of parallel screening for the past several decades. The NCI carries out an anticancer drug discovery program in which more than 100,000 different chemical entities have been screened, and another 10,000 novel chemicals are screened annually, in a panel of more than 60 human cancer cell lines from a variety of different cancer-disease tissues. 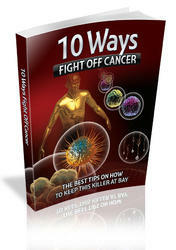 As testimony to the success of this approach, at least five compounds from the NCI screen have entered into phase I trials for oncology including the DNA intercalator, quinocarmycin, a DNA interactor termed spicamycin, KRN-5000 which disrupts glycoprotein processing the kinase inhibitors UCN-1 and flavopiridol, and depsipeptide NSC 630176, a histone deacetylase inhibitor (Bunnell et al., 2001; Dorr et al., 1988; Lee et al., 1995; Sedlacek, 2001; Seynaeve et al., 1994). The massive dataset achieved by the NCI has provided ample information for another type of analysis which can only be performed using parallel chemical-profiling data. These methods are used to extract another dimension of information which describes more than selectivity, potency, and even alternative indications. Higher-order analysis of parallel profiling experiments can suggest if not deduce the molecular mechanism of action (MOA) of a drug whose target was completely unknown. The following sections describe the growing importance of this powerful analytical technique and the promise it holds for deriving better molecular-defined cancer drugs.